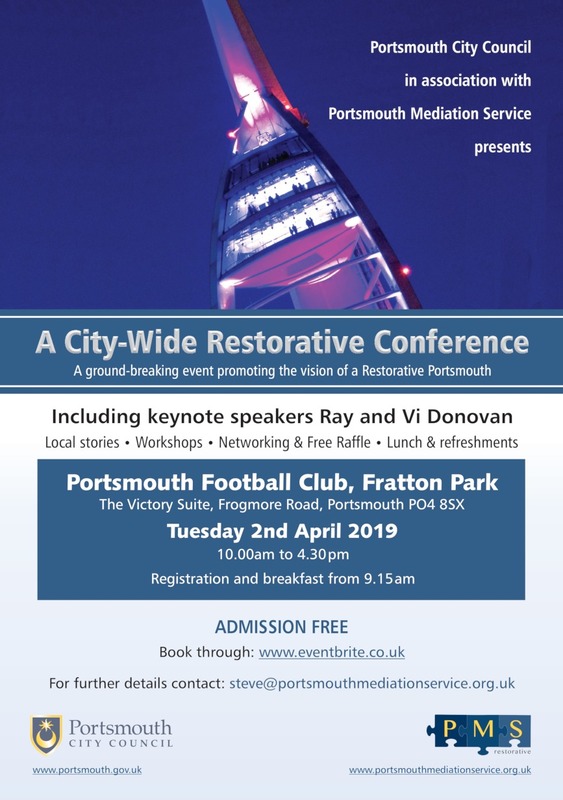 Portsmouth Mediation Service, in partnership with Portsmouth City Council, is promoting and hosting a city wide Restorative Conference at Fratton Park on Tuesday the 2nd April. This significant event will be another important step towards Portsmouth becoming a restorative city aiming to encourage and envision existing and new champions to build restorative communities and cultures. Key note speakers are Ray and Vi Donovan who lost their son when he was killed by a gang of youths. Their incredible story demonstrates that there are no no-go areas for Restorative Justice. The conference will include workshops, positive local stories and a panel of experts who will field questions from delegates. It’s expected to quickly sell out, attracting people from every sphere of city life.